Does Diazotrophy Enhance Coral Resilience? Coral reefs are highly productive ecosystems thriving in nutrient-poor waters. Their productivity depends largely on the availability of nitrogen, the proximate limiting nutrient for primary production. In reefs, the major nitrogen pathways include regeneration, nitrification, ammonification and dinitrogen (N2) fixation. N2 fixation is performed by prokaryotes called “diazotrophs” that abound in coral rubbles, sandy bottoms, microbial mats, or seagrass meadows. Corals, which are the main reef builders, have developed a partnership with dinoflagellates which transform dissolved inorganic nitrogen into amino acids and protein, and with diazotrophs to gain diazotrophically-derived nitrogen (DDN). Pioneering studies found active diazotrophic cyanobacteria in the corals' mucus and/or tissue, and later high throughput sequencing efforts have described diverse communities of non-cyanobacterial diazotrophs associated with scleractinian corals. Yet, the metabolic processes behind these associations and how they benefit corals are currently not well understood. While genomic studies describe the diversity of diazotrophs and isotopic tracer experiments quantify N2 fixation rates, combined advanced methods are needed to elucidate the mechanisms behind the transfer of DDN to the coral holobiont and whether these mechanisms change according to the identity of the diazotrophs or coral species. Here we review our current knowledge on N2 fixation in corals: the diversity and localization of diazotrophs in the coral holobiont, the environmental factors controlling N2 fixation, the fate of DDN within the coral symbiosis as well as its potential role in coral resilience. We finally summarize the unknowns: are the diversity, abundance and localization of diazotrophs within the holobiont species- and/or site-specific? Do they have an impact on DDN production? What are the metabolic mechanisms implicated? Do they change spatially, temporally or according to environmental factors? We encourage scientists to undertake research efforts to tackle these questions in order to shed light on nitrogen cycling in reef ecosystems and to understand if coral-associated N2 fixation can improve coral's resilience in the face of climate change. The Earth's climate is strongly influenced by the ocean, that takes up about one third of global carbon dioxide emissions (Sabine, 2004). This uptake depends partly on the biological fixation of carbon dioxide by photosynthetic microbes that need nutrients for their activity and growth. Among these nutrients, nitrogen is considered the proximate limiting nutrient for primary production in oligotrophic waters that cover ca. 70% of the global ocean surface (Falkowski, 1997; Moore et al., 2013). In this sense, dinitrogen (N2) fixation is recognized as an essential process for maintaining the productivity of ecosystems, as it replenishes the pool of biologically available nitrogen that is lost from the system via anaerobic ammonium (NH4+) oxidation and denitrification (Capone and Knapp, 2007). Coral reefs represent highly productive ecosystems despite often thriving in nutrient-poor tropical and subtropical waters (Odum and Odum, 1955). Their productivity also depends largely on the availability of nitrogen, that is continuously recycled (as NH4+) in the water column and sediments, either via bacterial regeneration of dead organic matter and animal catabolism (Wilkinson et al., 1984; Alongi et al., 2006), or within reef symbiotic organisms (Wang and Douglas, 1999). However, external nitrogen inputs are also required to sustain the high growth rates of reef benthos. There are several sources of external nitrogen supply (Paytan et al., 2006; Gove et al., 2016), and N2 fixation is considered one of the major potential sources, and can thus play an important role in sustaining reef primary productivity (France et al., 1998; Bell et al., 1999). Only specialized N2-fixing prokaryotes (so-called diazotrophs) are able to use N2 because they possess the nitrogenase enzyme, which cleaves the triple bond of the N2 molecule to form bioavailable NH4+. In coral reef ecosystems, diazotrophs have colonized a wide range of habitats, such as the water column (Riemann et al., 2010; Turk-Kubo et al., 2015), the sediments and dead coral surfaces (Davey et al., 2008; Bednarz et al., 2015b), the algal turfs (Rohwer et al., 2001; Haan et al., 2014; Rix et al., 2015), microbial mats and seagrass meadows (Rohwer et al., 2001, 2002; Charpy et al., 2012; Cardini et al., 2014), as well as sponge and coral tissue (Rohwer et al., 2002; Lema et al., 2014a,b). Still, their contribution to nitrogen cycling in the coral reef ecosystem as a whole, their spatial-temporal variability, level of activity and dependence on environmental factors, are poorly understood. In the following sections, we review our current knowledge on N2 fixation activity and diazotrophic diversity in different reef environments, assess the contribution of diazotrophically-derived nitrogen (DDN) to nitrogen nutrition and primary production of coral reefs, and give perspectives for future research with respect to the role of diazotrophs for coral reefs facing climate change. Studies on biological N2 fixation in tropical reef environments started with the early work of Wiebe et al. (1975) on the algal reef flats of Enewetak Atoll, (Marshall Islands) and Capone et al. 's (1977) study on the macroalgae of Caribbean reefs. Since then, the volume of published papers and data available has continuously and rapidly increased to reach ca. 8000 publications in the last 5 years (Figure 1). N2 fixation is indeed one of the main sources of new nitrogen in the ocean, necessary to sustain marine primary productivity (O'Neil and Capone, 2008), particularly in reefs where the availability of nitrogenous nutrients can be low, despite high flow rates above reefs (Atkinson and Bilger, 1992). In such environments, N2 fixation may play a key role for the health of reef organisms (D'Angelo and Wiedenmann, 2014). Figure 1. 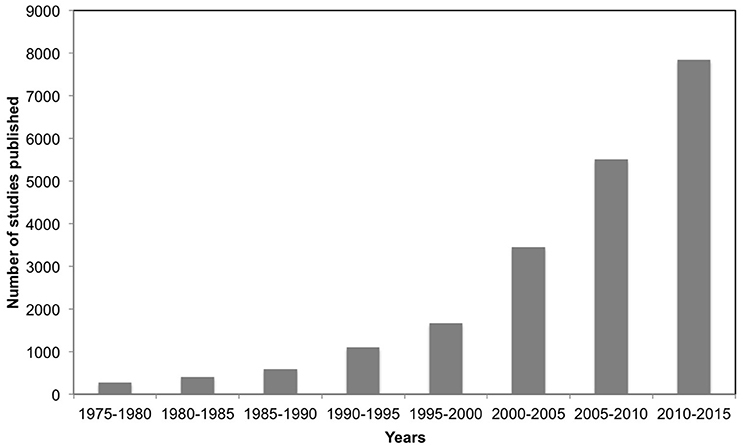 Number of scientific papers related to coral-associated N2 fixation, published since 1975. This diagram was obtained using Google Scholar and searching the number of papers related to N2 fixation in coral reefs on a 5 years period. High rates of N2 fixation have been measured in reefs sediments, rocks and dead coral skeletons, as well as related to several benthic (cyanobacterial mats, macroalgae, sponges, corals) and pelagic (unicellular cyanobacteria, Trichodesmium species) organisms (reviewed by Davey et al., 2008; O'Neil and Capone, 2008; Cardini et al., 2014). Rates of N2 fixation can either be expressed indirectly as ethylene (C2H4) produced from acetylene (C2H2) using the acetylene reduction assay (ARA), or directly as the amount of nitrogen assimilated using 15N2 tracer experiments (see Box 1). The lowest rates have been recorded in the water column (Capone, 2001; Foster et al., 2009; Knapp et al., 2016), compared to benthic environments such as reef sediments and hard substrates which often present high N2 fixation activities (Davey et al., 2008; O'Neil and Capone, 2008; Bednarz et al., 2015b; Rix et al., 2015). Epilithic communities recovering coral rubbles or dead coral skeletons can indeed fix up to 12 and 27 nmol N cm−2 h−1, respectively (Davey et al., 2008). N2 fixation rates are also high in sediments/sands, although they vary according to sand type. For example, there is a higher N2 fixation in carbonate than in silicate sands (2.88 and 1.52 nmol C2H4 cm−2 h−1, or 0.96 and 0.5 nmol N cm−2 h−1, respectively), likely due to the fact that the carbonate sand presents a higher porosity and permeability, allowing solute exchanges with seawater (Bednarz et al., 2015b). Another hot spot of N2 fixation in reefs is represented by microbial mats (where N2 fixation can be as high as 3.2 nmol N cm−2 h−1 or a mean of 1.66 nmol N cm−2 h−1) with beach-rock showing the highest rates (Charpy-Roubaud and Larkum, 2005). Compared to the above substrates, N2 fixation is much lower when diazotrophs are associated to sponges (Shashar et al., 1994; Rix et al., 2015) and soft coral species (0.001 to 0.205 nmol C2H4 cm−2 h−1 or maximum of 0.07 nmol N cm−2 h−1; Bednarz et al., 2015a), but can increase in the presence of scleractinian coral species up to 8.7 nmol C2H4 cm−2 h−1 (Davey et al., 2008; or 2.8 nmol N cm−2 h−1; Shashar et al., 1994; Lesser et al., 2007), as well as in turf algae (Haan et al., 2014; Rix et al., 2015). The dominance of turf algae is increasing in many reefs due to pollution and human degradation, both stresses inducing a shift from coral to algae dominance (Hughes et al., 2007; Cheal et al., 2010). Therefore, turfs represent one of the most dominant benthic components on many coral reefs in the Caribbean (Vermeij et al., 2010), central Pacific (Haas et al., 2010; Barott et al., 2012), Red Sea (Haas et al., 2010), and Indonesia (Wangpraseurt et al., 2012), and their high contribution to total reef N2 fixation has received increasing attention in the past years. Overall, it has been estimated that ca. 80 Tg N (or 80 × 106 tons) is fixed per year for diverse sites of the tropical ocean (Capone and Carpenter, 1999), and 14 Tg N yr−1 for the North Pacific (Deutsch et al., 2001). In One Tree Reef (Great Barrier Reef), cyanophyte algae are one of the main contributors of N2 fixation in reef flat and patch reefs (8 to 16 kg N ha−1 yr−1; Larkum et al., 1988). The primary limitation to estimate reef-wide N2 fixation is its spatial and temporal variability. N2 fixation largely varies depending on the diazotroph community composition, itself varying within and between reefs, or according to seasons and nutrient concentrations in seawater (O'Neil and Capone, 2008; Cardini et al., 2014, 2016a). N2 fixation rates can be assessed through different methods, mainly the acetylene (C2H2) reduction assay (ARA; Capone, 1993) and the 15N2 enrichment technique (Montoya et al., 1996). ARA is an indirect method that uses the ability of the nitrogenase enzyme to reduce triple bounded substrates. The enzyme reduces C2H2 into ethylene (C2H4), which can be directly compared with the reduction of N2 to NH4+. To convert C2H4 produced to N2 fixation fixed, a conversion ratio must be applied. The common theoretical ratios used are 3:1 or 4:1 (C2H4:N2) -depending on whether the recycling of hydrogen is considered or not- but empirically obtained ratios are usually higher (Mulholland et al., 2004; Benavides et al., 2011). where at%XSPON is the atom % enrichment in excess of natural 15N abundance (~0.366%) of the particulate organic pool (PON) or the N2 source (at%XSsource), t is the incubation time, and [PON] is the concentration of PON. This miscalculation has been shown to result in a severe underestimation of pelagic N2 fixation rates (Großkopf et al., 2012), and can be also a problem when estimating coral-associated N2 fixation (Grover et al., 2014; Benavides et al., 2016). To avoid this, Mohr et al. (2010) proposed pre-dissolving 15N2 into seawater and hence adding the tracer in its liquid form to samples prior to their incubation, with the aim of maintaining the 15N enrichment of the source N2 pool constant overtime. While this approach is theoretically correct, the preparation of 15N2-enriched seawater often entails contamination problems which can bias N2 fixation results (Klawonn et al., 2015). ARA was extensively used in the first coral-associated N2 fixation studies, given its relative simplicity and low cost (e.g., Shashar et al., 1994). However, although ARA can be a good proxy for overall rates of N2 fixation at the community level, it does not provide quantitative insight about where the diazotrophs are located, and/or who finally benefits from the new nitrogen source. Instead, the use of labeled 15N2 gas allows to measure net N2 fixation directly, and thus to trace the fate and assimilation of new nitrogen within the different coral compartments. While most of the pros and cons of both methods have been extensively compared in pelagic N2 fixation literature (e.g., Wilson et al., 2012; Klawonn et al., 2015), this has not been the case in coral-associated N2 fixation studies. Corals pose a number of difficulties that need to be tackled and taken into account to design a coral-specific N2 fixation assay. Measuring coral-associated N2 fixation in situ would require the use of benthic chambers, and filling them with 15N2 is economically unrealistic. Thus, cutting coral nubbins and incubating them in the lab is the usual approach. Another important issue is the expression of N2 fixation rates. In pelagic N2 fixation literature, volumetric (nmol N L−1 d−1) or depth-integrated (μmol N m−2 d−1) rates are now widely accepted (Luo et al., 2012). Coral-associated N2 fixation rates are so far either normalized per coral dry weight or per skeletal surface area (Williams et al., 1987), while studies on other benthic reef components (e.g., other cnidarians, algae) normalized rates also per wet weight or per chlorophyll a content of the organism under study (Wilkinson and Fay, 1979; Guerinot and Patriquin, 1981; Kayanne et al., 2005). These large differences in rate normalization pose a real difficulty when it comes to compare results both among studies and among different benthic reef components. Normalizing rates by cm−2 of skeleton also poses some degree of ambiguity given the large uncertainties associated to estimating coral surface (Naumann et al., 2009). In summary, the recurrent finding of active diazotrophs in tropical scleractinian corals across different parts of the globe calls for the establishment of a consensual N2 fixation method and a way to express results so that they can be easily compared among studies. The environmental control of N2 fixers has mostly been studied in systems other than coral reefs, such as in the open ocean or in terrestrial plants (Karl et al., 2002; Sohm et al., 2011). Few studies have investigated N2 fixation in reefs under various environmental conditions (Foster et al., 2009; Holmes and Johnstone, 2010; Haan et al., 2014; Rix et al., 2015). Some controlling factors are however applicable to all diazotrophs, such as oxygen which is known to deactivate the nitrogenase enzyme (Postgate, 1982), forcing diazotrophs to evolve various strategies to avoid oxygen deactivation including spatial separation at the cellular level (by confining nitrogenases in specialized cells called heterocysts), or through temporal separation (performing oxygen-evolving photosynthesis during the day and N2 fixation during the night). Some diazotrophs like the well-studied non-heterocystous cyanobacterium Trichodesmium are, however, capable of avoiding oxygen deactivation of their nitrogenases even fixing N2 during the day (Berman-Frank et al., 2003). In some reefs, daytime N2 fixation activity by reef pelagic diazotrophs was also found to be higher than night-time activity (Holmes and Johnstone, 2010; Haan et al., 2014), although substantial night-time N2 fixation was also measured in other reefs (Rix et al., 2015). Iron is the cofactor of the nitrogenase enzyme and hence its availablilty is often considered a limiting factor for N2 fixation and for diazotrophic cell growth (Berman-Frank et al., 2001). For example, iron made available through desert dust deposition events or through coastal mineral weathering have been often reported (Bonnet et al., 2009, 2015; Benavides et al., 2013). The availability of dissolved inorganic nitrogen forms tends to inhibit N2 fixation, given that the uptake of reduced nitrogen forms such as nitrate or NH4+ are much less energetically expensive for the cell than fixing N2 (which takes at least 16 ATPs; Postgate, 1982). However, on a global basis N2 fixation balances fixed nitrogen losses (via denitrification and anammox) maintaining the oceanic nitrogen reservoir (Deutsch et al., 2007), and hence N2 fixation responds to low N:P ratios (below the Redfield proportion of N:P = 16:1) in a positive feedback manner. As such, it is the N:P proportion what triggers or inhibits N2 fixation, rather than dissolved inorganic nitrogen concentrations per se (Knapp, 2012). N:P ratios have been poorly investigated in reefs, and to the best of our knowledge only two studies have assessed the importance of low vs. high N:P ratios on N2 fixation by reef diazotrophs: while the addition of phosphorus did not increase N2 fixation in the water column of the Gulf of Aqaba (Red Sea; Foster et al., 2009), it doubled in the same reef waters in the presence of coral mucus (i.e., organic matter release; Bednarz et al., 2017), which can be very rich in phosphate (Camps et al., 2016). This suggests that a combination of phosphorus and carbon-rich photosynthates are necessary to enhance N2 fixation. In the same line, measurements performed with or without coral colonies also showed that corals can enhance N2 fixation (Grover et al., 2014). This is due to the fact that corals form specific associations with diazotrophs (see Section Diversity of Diazotrophs in Tropical Corals), and they also release large amounts of mucus that constitutes an energetic substrate enhancing the growth of diazotrophs and N2 fixation rates. High rates of organic matter release by corals can also explain the higher rates of N2 fixation measured in the reef waters of Aqaba in summer as compared to winter (Larkum et al., 1988; Rahav et al., 2013; Bednarz et al., 2015a; Cardini et al., 2016a). In this area, high light and temperature in summer enhance coral photosynthesis and thereby the release of organic matter in addition to the fact that high temperature per se enhances pelagic N2 fixation too (Böttjer et al., 2016). Likewise, Davey et al. (2008) showed that coral death as a result of thermal bleaching enhanced N2 fixation through production of organic matter followed by the decay of coral tissue, which induced an increase in the development of microbial epiphytic and epilithic communities on coral skeletons. Finally, a recent study showed that low pH (decreased pCO2) significantly decreased N2 fixation associated with some coral species, likely due to a competition for energy between coral calcification or photosynthesis and N2 fixation (Rädecker et al., 2014). Taken altogether, these observations suggest that more studies have to be undertaken to assess N2 fixation rates in reefs under diverse environmental conditions, including climate change ones, because most of the knowledge comes from other systems and cannot be always applied to reef diazotrophs. Once fixed into diazotroph biomass, nitrogen can enter the trophic web through several processes, such as the direct consumption of diazotrophs by other organisms, or through extracellular release of fixed nitrogen compounds by diazotrophs in the form of NH4+ or dissolved organic nitrogen (DON) (Capone, 2001; see Section Coral Nitrogen Nutrition: Importance of DDN). N2 fixation can make a major contribution to the nitrogen supply in coral reef ecosystems, as it has been shown for the Eniwetok Atoll (Webb et al., 1975), the Great Barrier Reef (Larkum et al., 1988), and for the lagoons of Tikehau Atoll (Charpy-Roubaud et al., 2001) and New Caledonia (Charpy et al., 2007). N2 fixation and gross primary productivity are closely linked in the marine environment because DDN is a primary source of nitrogen which is used for many processes in plants, including photosynthesis, and the process of N2 fixation requires energy, mainly brought by primary producers. Capone and Carpenter (1982) provided the first estimates of the importance of N2 fixation for the net and gross primary productivity of reefs. However, recent studies (Charpy-Roubaud et al., 2001; Charpy et al., 2007; Casareto et al., 2008; Cardini et al., 2016a) have performed more comprehensive analyses on both seasonal and annual bases regarding the relative contributions of key individual benthic and pelagic categories to N2 fixation and overall reef primary productivity. Bednarz et al. (2015b) considered processes occurring in different reef sediments and estimated that DDN would supply 8.4, 8.1, and 13.3% of the total nitrogen needs for microphytoplanktonic productivity in carbonate sand, silicate sand and microbial mats, respectively. These estimates are similar to those obtained in the reef lagoon of New Caledonia (5–21% of the nitrogen required for primary productivity; Charpy et al., 2007), as well as those of the reefs of La Reunion (France, Indian ocean) and Sesoko (Japan) (5.7% to 28%; Casareto et al., 2008). It has to be noted that the above contributions of N2 fixation to the primary productivity of sediments can be underestimated because of the internal recycling of nitrogen, which can at times be important was not taken into account (Crossland et al., 1991), largely reducing the photometabolic demand for “new” nitrogen but increasing the relative nitrogen input via N2 fixation. N2 fixation of turf algae and coral rock, can supply between 20 and 27% of the nitrogen demand for net photosynthesis (Rix et al., 2015). At the reef scale, DDN can sustain ~10% of the total net primary production on an annual basis and up to 20% in summer, when inorganic nitrogen availability limits such primary production (Cardini et al., 2016a). Therefore, there is a positive correlation between the oligotrophic state of the reef and its reliance on DDN as a nitrogen source for primary productivity. A link between N2 fixation and respiration rates was observed for soft corals in the Gulf of Aqaba, where both processes peaked in summer (Bednarz et al., 2015a). The explanation for this link is that corals increase their respiration rates in summer while they build up biomass for reproduction, a process potentially sustained by N2 fixation. Conversely to all the observations above, no relationship was observed between N2 fixation and net primary production in the sponge Mycale fistulifera, mainly due to the fact that this sponge respires more than it photosynthesizes (Rix et al., 2015). As for N2 fixation rates, the contribution of DDN to primary production varies with the environmental conditions, the season and also depends on the rates of primary production. For example, DDN contribution to the primary production of Red Sea coral rocks varied from 2% in winter to more than 27% in summer, considering the maximal net primary production measured at midday (Rix et al., 2015). Moreover, DDN cannot only contribute to support the growth of primary producers, but also the growth of secondary producers via fixed nitrogen release from diazotroph cells (Mulholland et al., 2004; Berthelot et al., 2015; Bonnet et al., 2016), grazing (Williams and Carpenter, 1997), or via diazotroph biomass recycling. The estimations of the annual average of the total contribution of DDN to reef nitrogen cycle thus vary from 150 to ca. 2000 μmol N m−2 d−1 (Shashar et al., 1994). N2 fixing prokaryotes are known to be associated with various invertebrates such as sponges (Taylor et al., 2007), corals (Lesser et al., 2004; Oswald et al., 2007; Wegley et al., 2007; Olson et al., 2009; Lema et al., 2012, 2014a), sea urchins (Guerinot and Patriquin, 1981), ascidians (Kühl and Larkum, 2004), shipworms (Luyten et al., 2006) as well as other organisms such as dinoflagellates, diatoms, radiolarians and tintinnids (Foster and Zehr, 2006; Jyothibabu et al., 2006; Foster et al., 2009). Dinoflagellates, tintinnids, and radiolarians are associated with unique or diverse morphotypes of cyanobacteria, contained inside each host (reviewed by Foster et al., 2006). This is also the case for diatoms, which are found associated with the cyanobacteria Richelia and Calothrix (Foster et al., 2011), and ascidians, which host several phylotypes of the cyanobacterium Prochlorum didemni; this cyanobacterium can however inhabit inside or on the upper exposed surface of ascidians (Nielsen et al., 2015). Prochloron didemni is also a symbiont of sponges (Paerl et al., 1984; Parry, 1986), although they harbor several N2-fixing heterotrophic bacteria that are phylogenetically diverse, and are sponge-specific (Taylor et al., 2007; Mohamed et al., 2008). As for sponges, shipworms host in their Deshayes glands a large population of N2-fixing Gammaproteobacteria identified as Teredinibacter turnerae, which transfer to their host most of the fixed nitrogen (Lechene et al., 2007). Finally, nitrogenase reductase iron protein (nifH) gene sequences in corals, revealed a high diversity of both N2-fixing heterotrophic bacteria and cyanobacteria (Olson et al., 2009). Heterotrophic diazotrophs are species-specific in corals, since a conserved phylogenetic cluster of bacteria in the family Vibrionacea was found only in association with Montastrea capitata while a Gammaproteobacteria was associated with Montastrea flabellata (see Section Diversity of Diazotrophs in Tropical Corals). Cyanobacteria associated to corals were found to be related to the unicellular Synechococcus sp. or Prochlorococcus sp. (Lesser et al., 2004), although genes of filamentous cyanobacteria have been also reported (Wegley et al., 2007). Overall, these associations are all different, as shipworms, for example, host few symbiont types (Distel, 2002; Distel et al., 2002), while sponges host a high diversity of diazotrophs with representatives from all major prokaryotic N2 fixing taxonomic groups (Mohamed et al., 2008). Also, while the association between shipworms or diatoms and their diazotrophs is obligatory and can be described as a symbiosis (Prechtl, 2004), no study has actually shown if corals and diazotrophs form a facultative association or a real symbiosis. On one hand, Lema et al. (2012, 2014a) observed high species specificity in the diazotrophic bacteria that dominated the tissue of all coral species investigated, as well as a spatial and temporal consistency in the diazotroph community of the Acropora millepora microbiome. On the other hand, corals like Montastrea cavernosa can be observed with or without some diazotroph (cyanobacteria) symbionts (Lesser et al., 2004), which raises the question whether diazotrophs are only acquired by corals upon nitrogen stress situations. In addition, corals do not always profit from DDN, especially shallow corals which receive sufficient dissolved inorganic nitrogen from the ambient seawater (Grover et al., 2014; Bednarz et al., 2017). In summary, these observations raise the question whether diazotrophs are real coral symbionts or if they are only acquired upon nitrogen stress situations. Coral-associated bacteria were first discovered in the mucus layer (Ducklow and Mitchell, 1979; Ritchie and Smith, 1995). Because the mucus layer is highly dynamic and in constant contact with the surrounding seawater, at the dawning of coral microbiota studies it was unclear if these were opportunistic colonizations and/or interactions with water column bacteria, or if these bacteria truly lived associated to corals. However, subsequent studies found that coral-associated bacteria were more diverse and abundant than those in the surrounding seawater (Rohwer et al., 2001), and also present in other coral microhabitats such as the skeleton (Shashar et al., 1994) and the tissue (Rohwer et al., 2001, 2002), suggesting they are permanent residents despite the nature of their relationship with the host can either be beneficial or not (Rohwer et al., 2002). In the following years, several studies have reported bacterial communities specific to different coral species (Rohwer et al., 2001, 2002; Frias-Lopez et al., 2002; Bourne and Munn, 2005; Bourne et al., 2007; Sunagawa et al., 2010), while others have reported high intraspecific variability among reef sites (Guppy and Bythell, 2006; Littman et al., 2009b). Recent high-throughput sequencing efforts have revealed that spatially separated corals harbor a core microbiome composed of the same bacterial phylotypes associated with symbiont zooxanthellae, adding to a “floating” microbiome that changes with either coral species, time and/or space (Ainsworth et al., 2015). Differences in the composition of the microbiota of spatially-separated corals of the same species have been attributed to (i) the genotypic variability of the composition of the mucus layer, which chemical composition is thought to structure the colonizing bacterial communities (Ritchie and Smith, 1995, 2004; Ritchie, 2006), or (ii) as a response to changes in the surrounding environment (Klaus et al., 2005, 2007). Corals may adapt to changing environmental conditions by changing their associated microbiota, expelling microbes that do not longer provide any metabolic benefit and replacing them for others that do (the “coral probiotic hypothesis”; Reshef et al., 2006). However, having a variable, environmentally-adapted microbiota does not exclude having also a core, obligate symbiotic microbiota present in the same coral species independently of geographical location and/or environmental conditions experienced (Kooperman et al., 2007; Chen et al., 2010). While the discussion on the species- vs. site-specific coral microbiota has so far been focused on their genetic identity, it has been also proposed that specificity may rather lay on bacterial functional diversity (Krediet et al., 2013). Molecular biology methods in the past decades have provided invaluable insights into the diversity of coral's microbiota, but only recently genomics approaches have started revealing which functional traits lay behind the genetic identity of the microbes inhabiting the coral holobiont. A high degree of species diversity in a given coral species cannot be translated into a high abundance of different metabolic pathways and microbes with different identities may perform the same metabolic functions within a symbiosis (Bourne et al., 2016). The combination of genetic identification molecular biology techniques with metabolic pathway quantification geochemical techniques is needed to elucidate the true role of microbes in the coral symbiosis (see Box 2). 1) How does N2 fixation on coral reefs vary with changing environmental condition? Does the knowledge obtained in other systems also apply to reef diazotrophs? 2) How does N2 fixation influence reef ecosystem productivity and resilience? Will it be affected by climate change effects such as increased temperature, acidification, deoxygenation and sea level rise? 3) Are diazotrophs part of the permanent or of the floating microbiota of corals? Is it a true symbiotic relationship or rather a facultative association? 4) Does N2 fixation activity vary with diversity, abundance and/or localization of diazotrophs within the different microhabitats of the coral holobiont? 5) How are N2 fixation products assimilated by corals and transferred among coral holobiont microhabitats? Coral-associated bacteria may not only vary across large scales (e.g., one reef to another, one oceanic region to another), but also within the various microhabitats of the coral holobiont. Just as zooxanthellae adapted to different light intensities are distributed in the proximal-distal parts of the coral (Rowan et al., 1997), bacteria are likely spatially distributed throughout the microhabitats of the coral host (e.g., mucus layer, skeletal matrix, gastral cavity, etc.) according to their ecological function. Such “microzonations” are hard to assess when tissue slurry or other coral homogenates are used to obtain DNA samples, leading to a dramatic loss of information (Bourne et al., 2016). Coral-associated bacteria can either damage the animal host by causing disease (Rosenberg and Ben Haim, 2002; Krediet et al., 2013), or provide benefits via antibiotic production and substrate acquisition facilitation (Bourne et al., 2016). Coral-associated bacteria have been found to perform various metabolic functions, including having a role in carbon, phosphorus, sulfur and nitrogen cycles (Thurber et al., 2009; Kimes et al., 2010, 2013; Mouchka et al., 2010). In addition, establishing mutualistic relationships with diazotrophs is also a way to obtain nitrogen, if the right conditions are met (see Section Coral Nitrogen Nutrition: Importance of DDN), which likely benefit both the coral host and the zooxanthellae given that both harbor NH4+ uptake genes (Yellowlees et al., 2008). Although corals have several ways to acquire nitrogen, either via heterotrophic feeding (Houlbrèque and Ferrier-Pagès, 2009) or via the uptake of inorganic nitrogen through their symbionts (Grover and Maguer, 2002; Pernice et al., 2012), nitrogen remains a recurrent limiting nutrient for the growth and health of corals (Béraud et al., 2013). Crossland and Barnes (1976) and Williams et al. (1987) were the first to report N2 fixation activity in the stony corals Acropora cuminata and Goniastrea australensis, and Acropora variabilis, respectively. These authors found no clear evidence of epiphytic diazotrophic cyanobacteria over the coral colonies, pointing toward an active diazotrophic community living either within the coral tissue as endosymbiotic bacteria or as endolithic bacteria within the coral skeleton. Evidence for an active endolithic community was provided by Shashar et al. (1994). They measured N2 fixation in Favia favus and found that even after removing the coral tissue, N2 fixation activity continued in the coral skeleton when supplemented with glucose. In the late 1980s-early 1990s, while evidence of active N2 fixation in living corals started to accumulate, the identity of the responsible diazotrophs was unknown. Lesser et al. (2004) proposed phycoerythrin and the nifH gene as indicators for the presence of diazotrophic cyanobacteria in the epithelial cells of Montastrea cavernosa. While this coral was subsequently reported to be actively fixing N2 (Lesser et al., 2007), Oswald et al. (2007) demonstrated that phycoerythrin as analyzed in the previous study can give false-positive signals leading to an overestimation of the density of cyanobacteria in the tissue. By this time, the advent of new molecular biology techniques started to allow more detailed descriptions of the identity of coral-associated diazotrophs, but much work needed (and in still needs) to be done to establish whether these associated diazotrophs were coral species- or site-specific, whether they were permanent residents of the coral holobiont transmitted vertically through generations, or acquired horizontally when needed to confront nitrogen scarcity conditions. Using a pyrosequencing approach Wegley et al. (2007) described the identity and metabolic function of the bacterial community associated to the coral Porites astreoides sampled in Panama, and found both filamentous and unicellular diazotrophic cyanobacteria from the orders Chroococcales and Nostocales. Olson et al. (2009) reported a wide diversity of diazotrophs in Montipora capitata and Montipora flabellata collected in Hawaii. They found a diverse community including representatives of several proteobacteria classes (Alpha-, Beta-, Gamma- and Deltaproteobacteria), being Gammaproteobacteria the dominant class (~60% of all nifH sequences recovered). The authors developed a quantitative polymerase chain reaction (qPCR) approach to quantify Vibrio-like bacteria (which were the major group within the Gammaproteobacteria nifH sequences recovered), and found that their abundance was positively correlated with the abundance of zooxanthellae. The authors interpreted this correlation as and indication that DDN sustains the productivity of zooxanthellae to some degree, but may also provide fixed DDN to the animal host, concluding that Vibrio-like diazotrophs play a key role in the nitrogen metabolism of the coral holobiont. Nevertheless, Vibrio-like bacteria are well known to induce disease in corals and hence their potential beneficial role for the coral holobiont must be interpreted with caution (Munn, 2015). In contrast with earlier studies that considered cyanobacteria as the main diazotrophs associated to corals, the results of Oswald et al. (2007), and later Olson et al. (2009), reported a minimal contribution of cyanobacteria to the overall nifH sequences recovered (<5%). Likewise, Lema et al. (2012, 2014b) reported a clear dominance (65–71% of all sequences retrieved) of rhizobia-related bacteria (Alphaproteobacteria) in the tissues Acropora millepora, Acropora muricata, and Pocillopora damicornis, which is the diazotroph responsible for nitrogen nutrition in the roots of leguminous plants. The authors also reported differences in the diazotroph communities inhabiting the mucus layer and the coral tissue, with those in the mucus community being much more diverse and similar to that of the surrounding seawater (including Alpha-, Gamma-, Epsilon- and Deltaproteobacteria, as well as cyanobacteria representatives). This similarity of the mucus microbiota with that of the surrounding seawater is not surprising given the highly dynamic character of mucus and its constant interaction with the pelagic (Brown and Bythell, 2005). Rhizobia-related sequences were also retrieved from the tissues of Montastrea cavernosa in the Caribbean Sea (Olson and Lesser, 2013). The fact that rhizobia sequences could be only retrieved from the coral tissue could indicate a compartmental distribution of diazotrophs within the coral holobiont. For example, legume-associated rhizobia only fix N2 in oxygen-depleted conditions, thus it is plausible that coral-associated rhizobia only succeed at fixing N2 when the tissues experience microaerophilic conditions at night (but non-cyanobacterial diazotrophs may fix N2 actively at a wide range of oxygen concentrations; Bombar et al., 2016). Nevertheless, high concentrations have also been found in the mucus layer of Acropora sp. corals in the New Caledonian lagoon (Camps et al., 2016), which could be either due to (i) an active expulsion of tissue-associated rhizobia toward the surrounding seawater if no longer needed (the “coral probiotic hypothesis”) or to control the growth of zooxanthellae by limiting their nitrogen resources, or conversely (ii) due to a colonization of the mucus from seawater rhizobia, which can at times be abundant in the pelagic compartment (Le Moal et al., 2011). Similarly, while Vibrio-like diazotrophs have been reported to dominate the mucus of Mussismilia hispida (Chimetto et al., 2008), they are also often found in the tissues of other corals such as Montipora capitata (Olson et al., 2009). How corals acquire their microbial assemblages (zooxanthellae and prokaryotes) is unclear and likely highly variable among species and environments. Both horizontal (environmental) and vertical (genetic) transmission has been reported for zooxanthellae and prokaryotic associates (Harrison and Wallace, 1990; Chen et al., 2010; Ceh et al., 2013b). If one or the other transmission predominates may depend -at least to some degree- on the reproduction strategy of the coral species under study, i.e., brooding vs. broadcasting corals (Apprill et al., 2009; Littman et al., 2009a; Ceh et al., 2013a). Prokaryotes could offer diverse metabolic functions to the coral holobiont, and hence it is plausible that they are mostly acquired horizontally triggered by nutritional needs or environmental stress situations (Bourne et al., 2016), which is supported by the fact that horizontal transmission of bacteria often entails chemotaxis (Chen et al., 2010; Tout et al., 2015) and quorum sensing (Ransome et al., 2013). The fact that at times cyanobacterial diazotrophs can be present or not (Lesser et al., 2007), and that spatial variability of non-cyanobacterial diazotrophs within a given coral species have been observed (Lema et al., 2014b), suggests that coral-associated diazotroph assemblages can be very dynamic. Nevertheless, the recurrent finding of nifH sequences in corals of different sites and in different seasons of the year, either in the tissues and/or the mucus layer strongly suggests that diazotrophs may important for the coral holobiont, although the actual transfer of nutrients and how it benefits the host remains to be elucidated. The studies conducted so far indicate that diazotrophs are transferred horizontally, but if such transfer only takes place upon nitrogen limiting conditions cannot be currently confirmed (Chen et al., 2010). Lema et al. (2014a) detected rhizobia-related nifH sequences in larva, 1-week old juveniles, and adult specimens (Lema et al., 2012) of Acropora millepora, and also witnessed the horizontal acquisition of diazotrophic 15N2-labeled Vibrio bacteria in larva of the same coral species (Lema et al., 2015). These results strongly support that diazotrophs are ubiquitous members of the microbiome, hinting at their possible importance in the nitrogen metabolism of Acropora millepora. Nevertheless, the dominant associated diazotrophs may also vary depending on the health of the coral (Yang et al., 2015). Bacterial diversity decreases as corals grow, and the dominant groups also change with each life stage, likely reflecting a fine tuning of the hosted microbial community upon changes in metabolic needs in different life stages and/or when experiencing environmental stress or disease (Nissimov et al., 2009; Ceh et al., 2013b; Lema et al., 2014b; Santos et al., 2014 see Section Does Diazotrophy Enhance Coral Resilience?). In summary, coral-associated diazotrophs seem to be diverse, species-specific, and distinct between different coral holobiont microhabitats. While both cyanobacterial and non-cyanobacterial diazotrophs have been identified, non-cyanobacterial groups prevail with rhizobia (Alphaproteobacteria) and Vibrio-like (Gammaproteobacteria) as the dominant types found, which are likely permanent members of the coral microbiome and hence likely play a key role in supplying fixed nitrogen to the animal host and/or the zooxanthellae. Nevertheless, the mere detection of nifH sequences in corals needs to be interpreted with some caution. Firstly, PCR-based approaches may artificially amplify the presence of a given phylotype vs. others, which cannot be directly translated into abundance. Not even using quantitative approaches (e.g., qPCR) one can assess the abundance of diazotrophs accurately, since more than one nifH copy can be found per cell. Finally, the presence of nifH genes in a given coral species does not mean the associated diazotrophs were actively fixing N2. Function-diversity approaches are needed to elucidate which diazotrophs are actively performing N2 fixation in corals and in which condition this newly fixed nitrogen provides profits to the corals. Indeed, while a recent study using 15N2 (Benavides et al., 2016) showed that DDN is transferred to the zooxanthellae of corals in New Caledonia, another study (Grover et al., 2014) did not find any DDN incorporation in the symbionts or in the tissue of corals in the Red Sea, despite N2 fixation took place in the surrounding seawater. So far only few studies have provided evidence of the assimilation of DDN by corals either using the natural δ15N signature of corals or the 15N2 labeling technique (Lesser et al., 2007; Grover et al., 2014; Benavides et al., 2016; Bednarz et al., 2017). Grover et al. (2014) did not detect DDN assimilation by the coral, while the other studies did, underlining that DDN assimilation by corals is not a straightforward process but can be very variable depending on the current environmental conditions and the associated diazotrophic community. We know that corals harbor a distinct diazotrophic community within the skeleton, the tissue and the mucus layer, but is also still under debate whether the coral receives DDN from internal-associated (within the tissue or zooxanthellae), from external-associated (within the mucus layer or the skeleton) or from free-living pelagic diazotrophs. All these differently located diazotrophs can potentially provide fixed nitrogen to the coral via at least two pathways: (i) diazotrophs release fixed nitrogen compounds (in the form of NH4+) that are subsequently assimilated by the coral (i.e., the zooxanthellae); (ii) the coral host obtains DDN directly from ingestion and digestion of diazotrophic cells (Figure 2A). Figure 2. 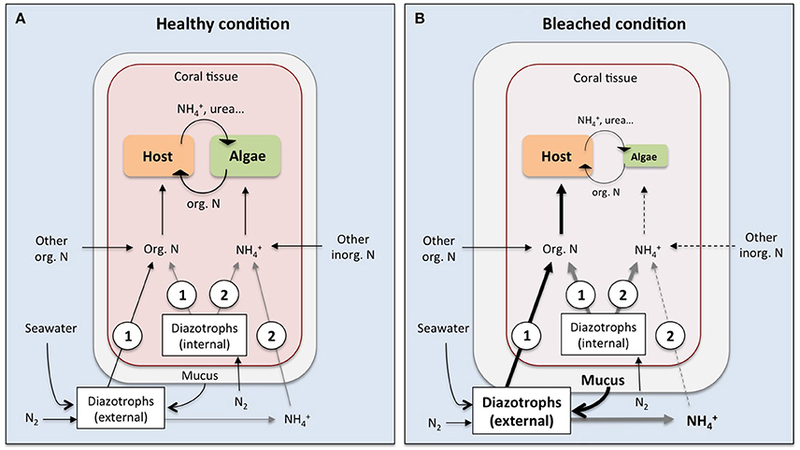 Potential pathways of nitrogen transfer from diazotrophic cells to the coral-zooxanthellae symbiosis under healthy (A) and bleached (B) conditions. The digestion of internal (facultatively associated or symbiotic within the coral tissue) or external (i.e., planktonic or mucus-associated) diazotrophic cells provides organic nitrogen directly to the coral host (1), while fixed nitrogen compounds (in the form of ammonium, NH4+) released by internal or external diazotrophs will be primarily available to the zooxanthellae (2). Bold arrows indicate potential amplification of pathways in bleached corals, where an increased diazotrophic abundance in the mucus layer combined with increased heterotrophic feeding on bacterial cells may provide additional nitrogen to the coral host. This could outbalance the reduced ability of corals to take up dissolved inorganic nitrogen from the surrounding seawater under thermal stress and bleached conditions (dashed lines). Black arrows indicate known pathways while gray arrows represent potential pathways that have not been empirically demonstrated yet. Pelagic diazotrophs fix N2 in excess and excrete that surplus to the environment (Mulholland et al., 2004). In a diatom-diazotroph symbiosis it was demonstrated that the N2 fixation rate was 171–420 times higher when the cells were symbiotic compared to the rates of cells living freely and that ~93% of the total generated fixed nitrogen is transferred to the diatom partner rather than used by the diazotroph itself or released to the water (Foster et al., 2011). Thus, in corals, one potential pathway is the direct uptake of DDN (i.e., in the form of NH4+) that has been excreted by the associated diazotrophs. The transfer of DDN to the coral host may be strongly influenced by the location of the associated diazotrophs. Diazotrophs can either be externally associated within the coral mucus layer or the coral skeleton, or internally within the coral tissue and zooxanthellae (Ainsworth et al., 2015; e.g., Olson et al., 2009; Lema et al., 2012). Although diazotrophs seem to be associated with all the different coral compartments the activity of these bacteria within the different coral microhabitats, and thus the origin of DDN within the coral holobiont, remains unsolved. Overall, DDN released from internal symbionts should be easier and faster accessible to the coral host as compared to DDN released from external symbionts. This has been previously shown for terrestrial plant-diazotroph symbioses in which DDN release by diazotrophs and uptake by the host occurs at interfaces where both partner are in close contact to each other (Rai et al., 2000). However, the exact mechanisms of release and uptake remain unexplored also for plant-diazotroph symbioses, but many of the interface membranes of both partners possess H+-ATPase, implying the presence of transport systems (Rai et al., 2000). Using multi-isotope imaging mass spectrometry Lechene et al. (2007) imaged and measured N2 fixation by endosymbiotic diazotrophs associated with shipworms. They found that DDN is transported to the bacterial cell surface and that animal cells immediately adjacent to the periphery of diazotroph cells assimilated more DDN compared to cells further away from diazotrophs. Overall, their results demonstrate the transfer of DDN from endosymbiotic diazotrophs to animal host cells. Although this process has not been described for coral cells yet, their findings provide strong implications for the transfer of DDN released by endosymbiotic diazotrophs to coral host cells. DDN in the form of NH4+ is supposed to be available to both the coral host and the symbiotic zooxanthellae as both possess the enzymatic machinery for NH4+ assimilation. Zooxanthellae assimilate NH4+ via the glutamine synthetase/glutamine:2-oxoglutarate aminotransferase (GS/GOGAT) cycle (D'elia et al., 1983; Roberts et al., 1999, 2001), while the coral host assimilates it via the action of GS and/or glutamate dehydrogenase (Miller and Yellowlees, 1989; Wang and Douglas, 1998; Yellowlees et al., 2008). However, it has been demonstrated that zooxanthellae account for most of the NH4+ uptake with assimilation rates 14–23 times faster compared to the coral host (Pernice et al., 2012). This is in agreement with previous N2 fixation studies on tropical corals demonstrating that DDN is primarily used by the zooxanthellae (Lesser et al., 2007; Benavides et al., 2016). Lesser et al. (2007) observed a significantly depleted natural δ15N signature in the zooxanthellae, but not in the animal tissue, when the corals were associated with diazotrophs. A depleted δ15N signature indicates that at least part of assimilated nitrogen is derived from DDN. Benavides et al. (2016) used 15N2 labeling and detected after a 4 h incubation period DDN assimilation only in the zooxanthellae and not in the animal tissue. Once DDN is assimilated by the zooxanthellae it enters the internal nitrogen recycling loop of the coral holobiont and will be translocated as recycled organic nitrogen from the zooxanthellae to the coral host (Kopp et al., 2013). This suggests that likely more than 4 h incubation time are needed in order to detect DDN assimilation by the host and is consistent with an observed time lag of 6 h for delayed nitrogen translocation from the zooxanthellae to the host (Kopp et al., 2013). Another pathway for the coral host to directly assimilate DDN is via grazing on diazotrophic cells (i.e., bacterivory). Benavides et al. (2016) demonstrated that corals assimilate DDN via active feeding on planktonic free-living diazotrophs. Corals are passive suspension feeders and trap particles and bacteria in their mucus as a nutrient source (Wild et al., 2004). Coral mucus contains a high abundance of diazotrophs, up to 400 times higher compared to the surrounding seawater (Camps et al., 2016), and is dominated by the N2-fixing bacteria Vibrio and Rhizobia (Chimetto et al., 2008; Lema et al., 2012). Again, Benavides et al. (2016) detected DDN assimilation exclusively in the zooxanthellae, although heterotrophic feeding on diazotrophs implies that the coral host will eventually assimilate the DDN. These authors suggested that digestion of diazotrophic cells started within the coelenteron and that zooxanthellae quickly assimilated prey nitrogen, probably in the form of NH4+. In contrast, the digestion and host assimilation of prey nitrogen in the form of dissolved and particulate organic nitrogen may need more time, impeding the detection of DDN assimilated in the host tissue after an incubation period as short as 4 h. The same study showed that the coral's DDN assimilation via grazing on planktonic diazotrophs greatly exceeded the assimilation rate of DDN derived from coral-associated diazotrophs. This underlines the potential importance of heterotrophic grazing on diazotroph cells for the coral nutrition (i.e., during coral bleaching, Figure 2B; see Section Does Diazotrophy Enhance Coral Resilience?). Nevertheless, future studies are necessary to localize the sources and fluxes of DDN within the coral symbiosis that can be achieved using 15N labeling combined with transmission electron microscopy and nanoscale secondary-ion mass spectrometry (nanoSIMS). Nitrogen is a major limiting nutrient for primary productivity in oligotrophic coral reefs (Hatcher, 1990). In order to cope with the limited nutrient availability corals have evolved physiological mechanisms that include an efficient uptake of nitrogen compounds from the seawater as well as conservation and recycling of nitrogen compounds within the coral-zooxanthellae symbiosis (Szmant et al., 1990; Tanaka et al., 2006). Uptake of particulate and dissolved nitrogen from the seawater can satisfy the nitrogen demand of corals by >100%. Heterotrophic feeding on particulate nitrogen sources was considered to satisfy most of the coral's nitrogen demand (Houlbrèque and Ferrier-Pagès, 2009), but also the uptake of dissolved nitrogen in the form of NH4+ (42%), nitrate (34%), dissolved free amino acids (21%) and urea (3%) together can contribute up to 100% to the coral's nitrogen demand (Grover and Maguer, 2002; Grover et al., 2003, 2006, 2008). However, the uptake of external nitrogen sources is concentration-dependent and coral reefs experience strong seasonal and diel variation in dissolved and particulate nutrient availabilities (Grover and Maguer, 2002; Cardini et al., 2015). Therefore, it was suggested that the association with diazotrophs is particularly beneficial to the nutrition of corals during periods of low nutrient availability in the surrounding seawater. The level of coral-associated N2 fixation activity also varies depending on the environmental conditions with highest N2 fixation rates during nutrient-depleted conditions indicating a potentially higher DDN availability for the coral symbiosis (Bednarz et al., 2015a; Cardini et al., 2015). A mechanistic nitrogen flux model shows that the uptake of dissolved nitrogen from the seawater can provide 149% of the required nitrogen but decreases down to 18% when dissolved nitrogen concentrations are low (Cardini et al., 2015). Conversely, the increased N2 fixation rates during nutrient-depleted conditions can provide up to 11% of the required nitrogen to the symbiotic zooxanthellae, thereby compensating for the reduced dissolved inorganic nitrogen availability in seawater. In contrast, DDN provided only 2% to the zooxanthellae nitrogen demand during periods of higher nutrient conditions (Cardini et al., 2015). This study estimated the contribution of DDN to the nitrogen budget of corals by measuring coral-associated gross N2 fixation and assuming that all DDN is transferred and assimilated by the coral-zooxanthellae symbiosis. Although we do not know how much of the total DDN is actually used by the coral, it could be as high as found on diatom-diazotroph symbiosis where ~93% of the total DDN is transferred to the diatom partner (Foster et al., 2011). Benavides et al. (2016) calculated that the ingestion of natural plankton (<100 μm) including diazotrophic cells would bring six times more nitrogen compared to the nitrogen input previously calculated for heterotrophic feeding on pico- and nanoplankton (Houlbrèque and Ferrier-Pagès, 2009; Benavides et al., 2016). These findings demonstrate that DDN in dissolved and particulate organic form can play an important role for the nutrition of corals and need to be taken into account in future studies that aim to calculate nutrient budgets for corals. This additional source of nitrogen is likely to be important to sustain net growth of corals particularly when external nutrient sources are insufficient or when the coral host nutritional status is impaired such as during coral bleaching events (see Section Does Diazotrophy Enhance Coral Resilience?). DDN may also benefit the fitness and survival of early coral life stages. It has been shown that adult corals release bacteria with their offspring and that coral larvae actively take up these bacteria into their tissue (Apprill et al., 2009; Ceh et al., 2013a,b). Roseobacter, Alteromonas and Vibrio-affiliated species are the most abundant bacterial taxa released by adult corals and are known to be capable of N2 fixation (Ceh et al., 2013a). Using fluorescence in situ hybridization (FISH) and nanoSIMS the incorporation of Vibrio sp. cells was observed into the aboral epidermis of coral larvae of Acropora millepora, where Vibrio cells clustered in elongated aggregations (Lema et al., 2015). Thus, the early establishment of a coral-diazotroph association suggests that diazotrophs may supply the coral larvae with additional nitrogen, but further investigations are required to unveil such transfers. On the coral reef ecosystem scale, the contribution of coral-associated N2 fixation to reef-wide benthic N2 fixation is low compared to other benthic reef compartments such as turf algae, microbial mats, coral rock or reef sands, but occasionally relevant (~18%) during certain periods of the year (Cardini et al., 2016a). This suggests that DDN input from coral-associated diazotrophs is mostly of lower importance for the nitrogen budget of the entire coral reef, but it may facilitate coral reef ecosystem functioning indirectly by fueling the high productivity of corals and coral mucus production. Corals are the main primary producers on coral reefs and are also known to release large quantities of organic material to the surrounding water (Wild et al., 2004). This material contains high concentrations of both organic and inorganic nitrogen compounds and its production may be fueled by DDN. Once mucus is released into seawater it rapidly forms aggregates that sink to the seafloor thereby initiating biogeochemical nitrogen cycling in carbonate sands and pore waters (Wild et al., 2004, 2005). Despite covering a small surface on a global basis, coral reefs comprise ~25% of all marine species (Connell, 1978), and are considered the most diverse ecosystems on Earth. The health and expansion of coral reef ecosystems is currently threatened by global warming, sea level rise, ocean acidification, eutrophication and overfishing (Knowlton, 2001; Hughes et al., 2003). Adding to predicted global temperature increase scenarios, contemporary temperature increments as thus induced by El Niño events are currently provoking massive coral bleaching events (Hoegh-Guldberg and Ridgway, 2016; e.g., Shashar et al., 1994). Coral reef loss does not only have dramatic environmental consequences, but also can severely reduce the economic benefits these ecosystems provide to their riparian countries (i.e., fisheries, coastal protection and tourism), estimated at $375 billion per year (Constanza et al., 1997). As introduced earlier, the growth and health of reef ecosystems does not only depend on the zooxanthellae-host symbiosis, but also on a variety of bacterial and archaeal microorganisms that perform important metabolic functions that benefit the animal host (Bourne et al., 2016). To date, the dynamics of coral-associated microbiota are not well understood, and it is likely that an adaptive microbiota enhances the resilience of corals facing environmental stress (Ainsworth et al., 2010; Garren and Azam, 2012; Bourne et al., 2016). Environmental stress factors such as bleaching, thermal stress, irradiance, disease or changes in organic matter may disrupt the symbiotic relationships of the coral holobiont, often resulting in a change of the coral-associated microbiota genetic and/or functional diversity (Ritchie and Smith, 1995; Kline et al., 2006; Smith et al., 2006; Thurber et al., 2009; Garren and Azam, 2011; Krediet et al., 2013). This change can be either direct (the environment affects the microbiota) or indirect (the environment affects the coral host physiology, which in turn forces a change in its associated microbiota Ritchie, 2006; Mouchka et al., 2010). The destabilization of the coral holobiont symbioses can promote a shift of its former, healthy state microbial communities, for opportunistic and pathogenic microbes (Thurber et al., 2009; Bourne et al., 2016). When inputs of zooxanthellae-derived fixed carbon are shutdown, bleached corals rely on alternative energy sources such as storage reserves or heterotrophic feeding (Grottoli et al., 2006). While the degree to which bleached or in recovery corals rely on reserves or heterotrophic feeding to recover varies among species, it has been reported that they can meet up to 100% of their carbon metabolic requirements via heterotrophic feeding (Grottoli et al., 2006; Houlbrèque and Ferrier-Pagès, 2009). The recent finding that Stylophora pistillata corals fulfill an important part of their nitrogen needs via heterotrophic consumption of planktonic diazotrophs (Benavides et al., 2016) raises the question whether this source of nitrogen acquisition would also be enhanced to face environmental stress, as observed in other coral species that increase heterotrophic feeding when the translocation of carbon fixed by zooxanthellae is disrupted due to bleaching. Indeed, the loss of zooxanthellae during bleaching events does not only imply a loss of fixed carbon availability to the coral host, but also a decrease in its nitrogen acquisition capacity (Ferrier-Pagès et al., 2010; Godinot et al., 2011; Ezzat et al., 2016). In such events, corals' resilience could be enhanced by alternative fixed nitrogen sources such as that provided by endosymbiont diazotrophs. For example, Santos et al. (2014) reported that the abundance and diversity of diazotrophs associated with the coral Mussismilia harttii increase in response to +2 to +4.5°C above in situ background seawater temperature. In the Red Sea coral-associated N2 fixation rates have been reported to increase 3- to 10-fold when corals are artificially exposed to higher temperatures (Cardini et al., 2016b) as well as in response to natural rising temperatures in the summer, suggesting that DDN could provide alternative nitrogen sources when environmental nutrient concentrations are scarce (Cardini et al., 2015). While there is the possibility that DDN increases the coral's bleaching resilience or facilitates the recovery from bleaching events, Rädecker et al. (2015) raised a contrary hypothesis. They suggested that increased N2 fixation in corals exposed to elevated temperatures could instead enhance their bleaching susceptibility as elevated DDN availability would cause an imbalanced nutrient supply (i.e., increased N:P ratio) to the coral host that would disrupt the nitrogen limitation of the zooxanthellae and subsequently imbalance the coral-zooxanthellae symbiosis (D'Angelo and Wiedenmann, 2014). These contrasting hypotheses highlight the urgent need to better understand the role and underlying mechanisms of DDN involved in coral bleaching. Furthermore, it has been suggested that coral bleaching followed by coral mortality can affect the nitrogen budget of the reef ecosystem due to the overgrowth of coral skeletons by epilithic communities including diazotrophs. Davey et al. (2008) demonstrated that N2 fixation rates by epilithic communities peaked two weeks after coral mortality with up to 30-times higher rates compared to living corals. This would provide a “new” autochthonous source of nitrogen after coral mortality that may influence the biomass and nitrogen cycles on the reef. Whether this nitrogen is sufficient to reinforce a phase-shift from a coral- toward an algae-dominated reef warrants further investigation that can help managing coral reefs affected by bleaching. Rising seawater temperatures will likely promote seawater column stratification, hindering vertical mixing and consequently impoverishing nutrient concentrations in surface waters (Passow and Carlson, 2012). In such a scenario, it is likely that nutrient-limited corals will increasingly rely on DDN to meet their nitrogen metabolic requirements. Conversely, increased pCO2 has been reported to decrease coral-associated N2 fixation, suggesting that nitrogen starvation of the coral host may exacerbate the long-term effects of ocean acidification (Rädecker et al., 2014). Although we are just beginning to understand the effect of single stressors on N2 fixation, additional multiple stressor studies are needed to assess synergistic or antagonistic climate change effects on coral-associated N2 fixation and its responsible diazotroph communities. Coral show species-specific degrees of resilience to increased temperatures mostly due to intrinsic differences (phenotypic and genetic) among the coral hosts and their microalgal symbionts (reviewed in Hughes et al., 2003). Also, the coral-associated diazotroph community may respond in very different ways to climate change effects such as acidification or temperature (e.g., Gradoville et al., 2014). Conversely, increased anthropogenic nitrogen loading in coastal areas may act as a negative feedback on coral-associated diazotrophs, inhibiting their N2 fixation activity (Cardini et al., 2015). All in all, it is difficult to predict how coral-associated diazotrophs' diversity and N2 fixation potential will respond to climate change. Clearly, a more comprehensive understanding of how diazotroph-coral symbioses function in healthy conditions is needed before we can predict responses to different climate change and anthropogenic pressure scenarios (Bourne et al., 2016). At the ecosystem level (Box 2), there is a significant lack of knowledge on the nitrogen budget in reefs, and on the extent of the importance of its different pathways such as N2 fixation, nitrification, denitrification and anammox. This is mostly due to the unknown contribution of the different reef symbioses to these processes. For example, it has only recently been demonstrated that sponges can be major players of nitrogen cycling in reefs, together with other planktonic symbioses such as those of diatoms and protists (Fiore et al., 2010; de Goeij et al., 2013). In addition, the impact of environmental changes, such as water acidification, warming and eutrophication is still unknown, despite the fact that all factors directly influence N2 fixation and can have antagonistic effects. For example, increased acidification can enhance the nitrogenase activity and thus N2 fixation of some organisms such as Trichodesmium (Barcelos e Ramos et al., 2007), but also poses threats to calcifying organisms (Orr et al., 2005), some of which are hosts to N2-fixing symbionts (Thompson et al., 2012). Rising sea surface temperatures also increase N2 fixation by diazotrophs in sediments or rocks, but leads to coral bleaching, which in turn induces a change in the associated microbial communities (Thurber et al., 2009). At the organism level, the main pending questions taking the coral holobiont as a model are also highlighted in Box 2. We should first focus on focus on better characterizing of the existing symbiotic diazotrophs, using advanced molecular techniques such as metagenomics and metatranscriptomics. This last tool can provide information on the microbial metabolic functions present in addition to their phylogenetic identity, providing a first link between biodiversity with functional investigations. However, transcriptomics results do not provide information on the molecular composition of the substrate being synthesized or metabolized, or at which rate these processes happen. To gain this information genomics and transcriptomics should be combined with metabolomics. Metabolomics is the scientific discipline that characterizes the metabolites (or low molecular weight dissolved organic matter produced by a given microbe. The metabolome is the result of a metabolic function, encoded in the microbe's DNA, expressed through messenger RNA to synthesize proteins, which are then used to metabolize substrates and synthesize metabolites which are eventually released out of the cell, and used for a variety of ecological functions (e.g., nutrient acquisition, cell signaling, species competition) (Kujawinski, 2011). A remaining challenge however is to accurately separate the DNA/RNA/protein fractions of the different constituents of the holobiont (prokaryotes, zooxanthellae and host tissue), which is not easy since mitochondrial DNA often dominates the DNA dataset (Vega Thurber et al., 2008; Littman et al., 2011). There is thus a critical need for the development of coral-specific ’omics protocols (Bourne et al., 2016). Another challenge will be to locate the diazotrophs within the different compartments of the symbiosis and assess which of these diazotrophs contribute most importantly to the DDN production in the symbiotic association. For example, the ubiquitous presence of diazotrophs in both the mucus layer and the skeleton of most coral species surveyed, and within the tissue of some other species suggest a high functional relevance of these groups for the coral health. However, the extent to which these diazotrophs contribute to the nitrogen needs of the coral host and its associated zooxanthellae is still unknown. To achieve this localization, however, a substantial attention will have to be paid in separating the different compartments of the symbiosis, i.e., mucus, tissue, zooxanthellae, skeleton. A direct localization of the diazotrophs can be achieved using specific primers and the FISH technique. Finally, the advent of single-cell isotope mass spectrometer technology such as nanoSIMS (nanoscale secondary ion mass spectrometry), now allows to detect 15N enrichment (from 15N2 fixation) in different compartments of the symbiosis without physically separating them prior to analysis (Pernice et al., 2014), an approach that promises elucidating how nitrogen is transferred between different coral microhabitats, as well as how nitrogen is used by the different partners (Pernice and Levy, 2014). Finally, all the classical and newer techniques should be applied in combination to address the effect of climate change stressors and eutrophication on coral reef organisms but also to assess what is the role of diazotrophs for the functioning and resilience of the coral symbiosis facing climate change. As reviewed in the above sections, stressors may indeed have contrary effects on the diazotroph activity/abundance and the animal host and a better knowledge on the effect of each stressor on the symbionts, host and the whole association is needed. Funding was provided by the Centre Scientifique de Monaco. We want to thank Prof. D. Allemand, Director of the Centre Scientifique de Monaco, for scientific support. Capone, D. G. (1993). “Determination of nitrogenase activity in aquatic samples using the acetylene reduction procedure,” in Handbook of Methods in Aquatic Microbial Ecology, eds P. F. Kemp, J. J. Cole, B. F. Sherr, and E. B. Sherr (London: CRC Press), 800. Casareto, B. E., Charpy, L., Langlade, M. J., Suzuki, T., Ohba, H., Niraula, M., et al. (2008). “Nitrogen fixation in coral reef environments,” in Proceedings of the 11th International Coral Reef Symposium, Vol. 2 (Fort Lauderdale, FL), 896–900. Ducklow, H. W., and Mitchell, R. (1979). Bacterial populations and adaptations in the mucus layers on living corals. Limnol. Oceanogr. 24, 715–725. Harrison, P. L. Wallace, C. C. (1990). “Reproduction, dispersal and recruitment of scleractinian corals,” in Ecosystems of the World, Vol. 25, Coral Reefs, ed Z. Dubinsky (Amsterdam: Elsevier Science Publishing Company, Inc.), 133–207. Hoegh-Guldberg, O., and Ridgway, T. (2016). Coral Bleaching Hits Great Barrier Reef as Global Temperatures Soar. Green Left Weekly. Jyothibabu, R., Madhu, N. V., Maheswaran, P. A., and Devi, C. (2006). Environmentally-related seasonal variation in symbiotic associations of heterotrophic dinoflagellates with cyanobacteria in the western Bay of Bengal. Symbiosis 42, 51–58. Montoya, J. P., Voss, M., Kahler, P., and Capone, D. G. (1996). A simple, high-precision, high-sensitivity tracer assay for N2 fixation. Appl. Environ. Microbiol. 62, 986–993. O'Neil, J. M., and Capone, D. G. (2008). “Nitrogen cycling in coral reef environments,” in Nitrogen in the Marine Environment, eds D. G. Capone, D. A. Bronk, M. R. Mulholland, and E. J. Carpenter (San Diego, CA: Academic Press), 949–989. Parry, D. L. (1986). Prochloron on the sponge Aplysilla sp. BMS 38, 388–390. Postgate, J. R. (1982). The Fundamentals of Nitrogen Fixation. Cambridge: Cambridge University Press. Ritchie, K. B., and Smith, G. W. (1995). Carbon-source utilization patterns of coral-associated marine heterotrophs. J. Mar. Biotechnol. 3, 105–107. Wang, J., and Douglas, A. E. (1998). Nitrogen recycling or nitrogen conservation in an alga-invertebrate symbiosis? J. Exp. Biol. 201, 2445–2453. Copyright © 2017 Benavides, Bednarz and Ferrier-Pagès. This is an open-access article distributed under the terms of the Creative Commons Attribution License (CC BY). The use, distribution or reproduction in other forums is permitted, provided the original author(s) or licensor are credited and that the original publication in this journal is cited, in accordance with accepted academic practice. No use, distribution or reproduction is permitted which does not comply with these terms.